The eastern coast of Sicily has historically been one of the most geologically active in all of Europe, dominated by the hulking mass of Mount Etna, Italy’s largest active volcano. Etna’s fiery history has been documented since ancient times, bestowing its slopes and the plain of Catania with rich and fertile volcanic soil. Today Etna continues to spew forth molten lava, smoke and ash practically non-stop, making it a Mecca for both volcanologists as well as tourists. Rising to nearly 11,000 feet, Mt. Etna is an imposing sight, reflected in one of its Sicilian names Mongibeddu, a corruption of the Latin and Arabic words for “mountain”. In Sicilian the repetition of a word can be used for emphasis, so Mongibeddu roughly translates as “mountain mountain”, to distinguish it as the biggest. For those that live on or near the slopes of Etna, it is often referred to as a’ muntagna, or “the mountain”. However the common name of the mountain, Etna is derived from its Roman name Aetna and was considered the home of the god of fire, Vulcan. Even back then Etna was nearly under a constant state of eruption, making it the world’s most active volcano. Only the Hawaiian volcano Kilauea produces more lava than Etna, but has only been continuously active less than thirty years. Compare that to Mt. 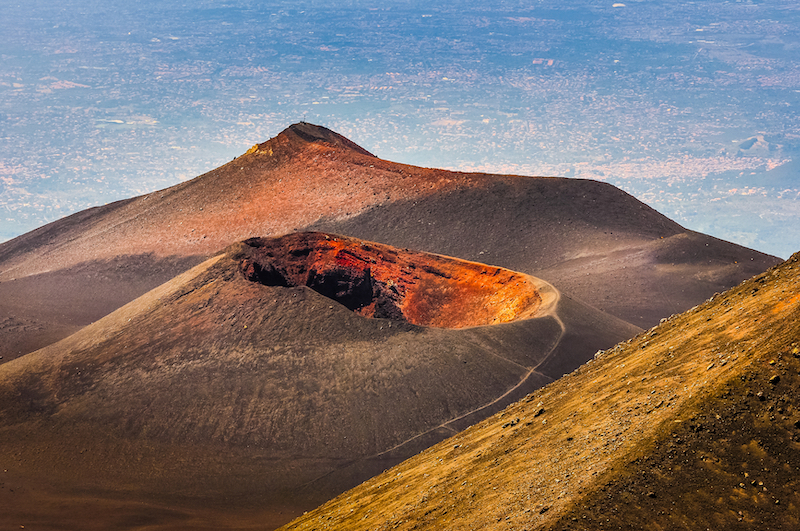 Etna’s span of over three thousand years of constant volcanic activity. The volcano itself is very complex and is hard to classify since it displays many different characteristics. Mt. Etna shows traits of a shield volcano like Kilauea, which constantly oozes rivers of lava. However Etna is also known to have traits similar to a strato volcano like Mt. Vesuvius, which are known for their infrequent but violent eruptions and deadly pyroclastic flows. Etna has not one but four main craters at its top, with the Bocca Nuova being the most active and youngest. There are also hundreds of smaller craters found on Etna’s slopes, especially in the area known as the Valle del Bove. Some of these lesser craters and cinder cones are large enough to be considered volcanoes in their own right, if not part of the larger mountain. Even though Mt. Etna is extremely active, the locals see the volcano more as a blessing than a danger. The rich volcanic soil allows for thriving farms and orchards across the Plain of Catania as well as on the mountain itself. However Mt. Etna does do some damage from time to time, as the lava covered houses on its slopes will testify to. In 1669 lava flows from a particularly large eruption destroyed several villages and even threatened the city of Catania when the lava breached the city wall. Throughout its long history (including ancient Greek and Roman cities), Catania has been covered by Etna’s lava seven times, but has not been threatened by the volcano since 1669. The biggest threat to Catania is not Etna’s lava but violent earthquakes that have been very deadly in the past. Today certain measures are taken when lava flows threaten towns or important infrastructure, such as attempts to divert lava flows with explosives. However these attempts usually meet with only partial success and lava from Etna occasionally damages or destroys property, usually tourist related facilities and restaurants built on the slopes. Etna’s eruptions may cause property damage, but they are not very deadly. In fact there have only been 77 confirmed deaths directly related to Mt. Etna over the thousands of years of recorded volcanic activity. Etna may seem tame due to the fact you can hike up this very active volcano, it is still a volcano and visitors still must take caution. The most recent deaths on Etna were due to carelessness of tourists getting too close to erupting vents or being struck by lightning. It might be a tourist attraction but Mt. Etna is still a powerful example of nature’s fury.